Running an effective discovery call often means the difference between winning and losing a sale. Your discovery call sets the trajectory of the deal. It dictates how you present, what objection handling scenarios you’ll run into, and how much negotiation leverage you find yourself with at the end of the sales process. So, what makes a winning discovery call? It actually depends on who you’re selling to. 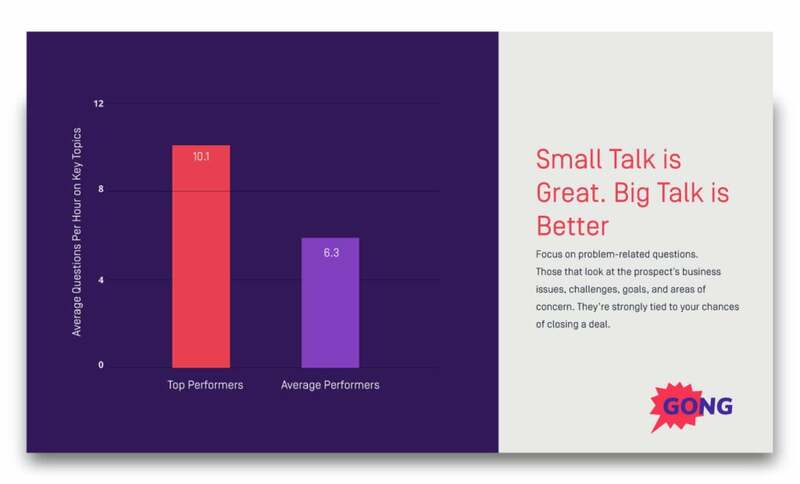 We analyzed 519,000 recorded discovery calls with AI to understand what drives successful outcomes. 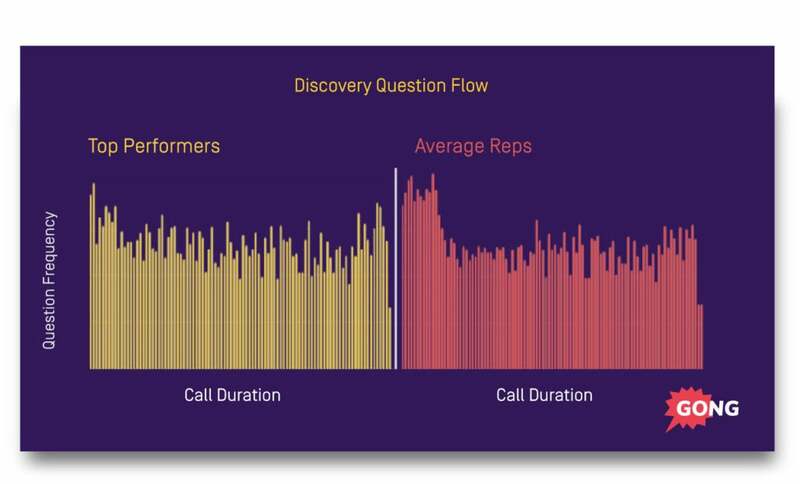 These discovery calls were recorded on web conferencing platforms with Gong.io, transcribed, and analyzed with unsupervised machine learning to identify the discovery call questions and techniques that drive revenue. Let’s take a look at what we learned. 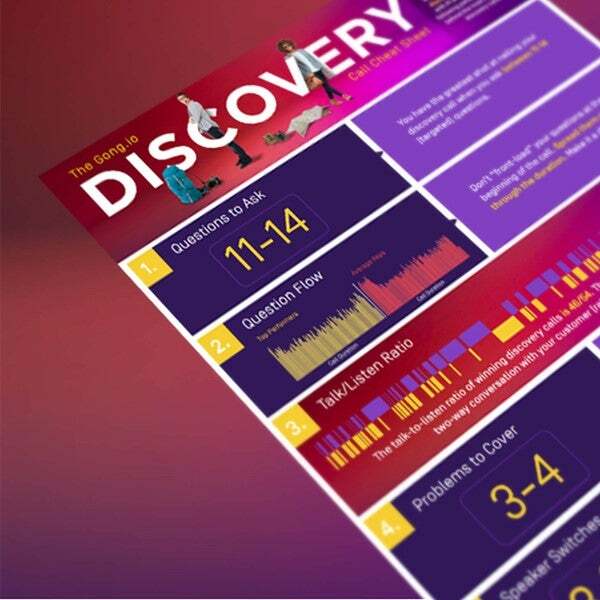 First, we found that the most effective discovery calls uncover between three and four business problems. The algorithms that analyzed the calls in this study are able to detect what topics are being discussed at each point of the call. The most successful salespeople tend to dive deeply into 3-4 customer problems, and then wrap up logistics and next steps at the end. Why not more? Why not less? But my hypothesis is that less than that, and you don’t have a buyer in enough pain. More than that, and they have too many priorities going on at once to make any headway with you. This leads us to our next discovery call data point. The number of discovery call questions to ask. 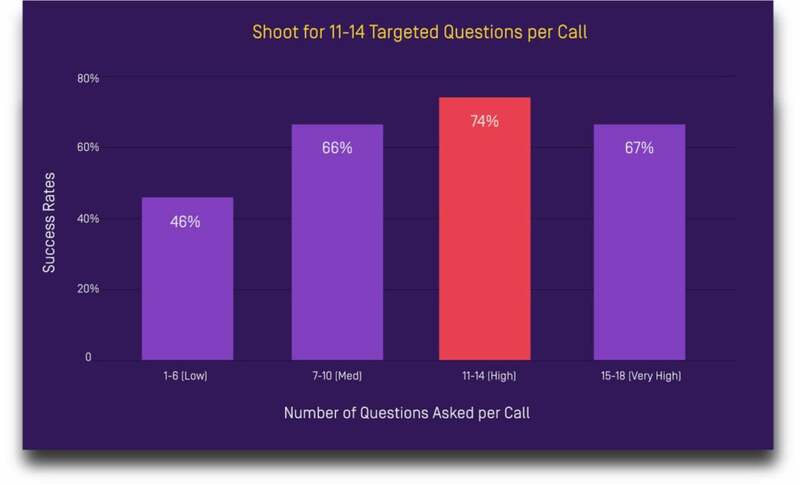 In our analysis, we found that asking between 11-14 discovery call questions during the course of the call correlates with the greatest success. Less than that and your discovery call may not be robust enough. More than that, and it will likely start to feel like an interrogation, rather than a natural conversation. First, the types of discovery call questions you ask matter dearly. Asking a generic line of questioning is likely to get you kicked in the teeth. Your best bet for discovery call success is asking questions about key business problems or goals the customer is trying to solve for. Let me explain the above chart. Like I mentioned, the technology we used to analyze these discovery calls can identify specific topics that are being discussed. 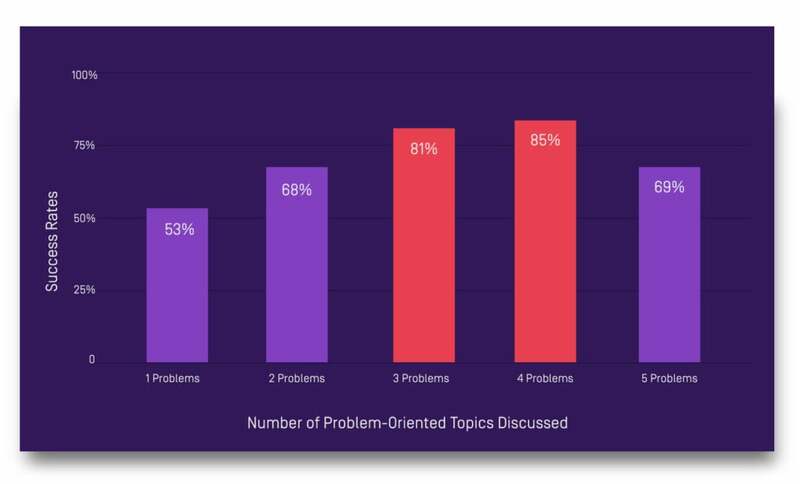 We found that top sellers most after ask their questions while discussing problem-related topics with their buyers. They ask fewer questions outside of discussing those topics. Here’s your next tip on asking discovery call questions. Phrase your questions in a way that prompt your buyer to give you a long response. 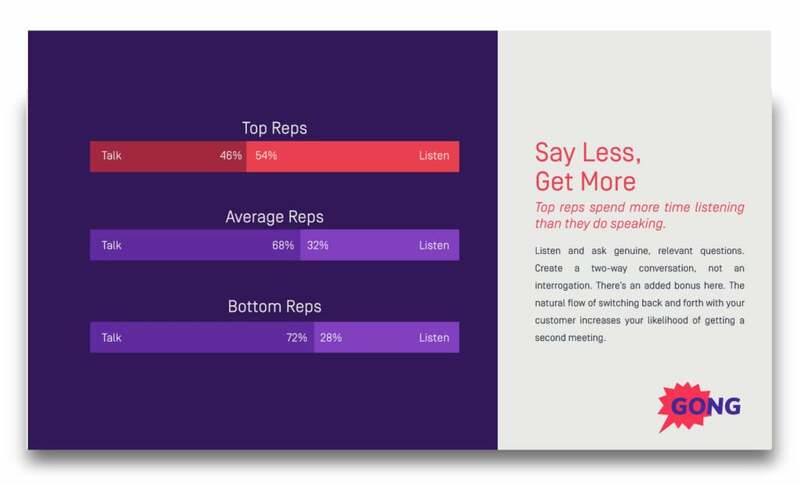 We found that there’s a direct correlation between getting your customer to talk uninterrupted for a long time in response to a discovery call question. Phrasing your discovery call questions in these ways encourages your buyer to respond thoroughly. Which helps your cause in closing the deal. The more your discovery call feels like a natural conversation, the better. But also avoid interrogating your buyer with questions. Notice the question velocity the most successful salespeople. Top sellers balance and spread their discovery call questions evenly throughout the sales call. “Average” salespeople, by contrast, “frontload” their questions at the beginning of the call. It’s as if they’re making their way through a to-do list of pre-loaded discovery call questions. It also turns out that the more back-and-forth dialogue there is, the more likely you’ll succeed. 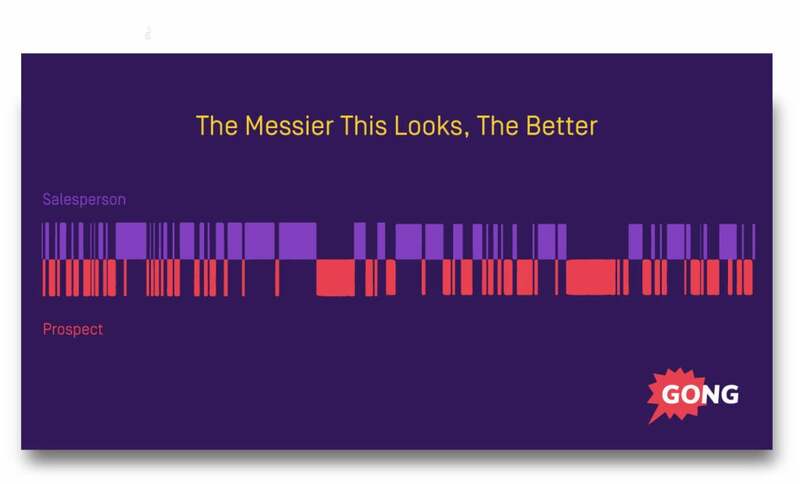 We measured “speaker switches per minute,” and found there is a strong correlation with discovery call success. You get your customer to talk more. And you do so in a natural way. One that doesn’t feel like an abrasive interrogation or barrage of discovery questions. Alright, you’ve learned all I have to offer for now. Having winning discovery calls is easier said than done. That’s why we turned everything you read in this post into a free, printable cheat sheet. Download it, print it out, and tape it to your wall. It’ll help you reinforce everything you learned about what makes a winning discovery call. Click the banner below to download your discovery call cheat sheet today. Be prepared to be thrown for a twist. One year after we conducted this discovery call analysis, we did another one. This new one was specific to C-Suite executives. In other words, the first discovery call analysis analyzed 519,000 discovery calls across a breadth of different buyers: VPs, C-Levels, mid-level managers, you name it. The new analysis analyzed sales calls where the seller was specifically talking to a C-Suite executive. Asking too many discovery call questions greatly harms your sale when selling to the C-Suite. Number one: Discovery calls are best done as research tools with other people in the organization. By the time you get to the C-Suite, you should know your stuff. Putting a C-Suite executive through the typical discovery call is likely to get you kicked in the teeth. Next, assuming you’ve done your homework by hosting discovery calls with other people in the organization, selling to the C-Suite requires a new sales strategy. You have to bring insights to the table when selling to the C-Suite. Teach them about key problems that have been sitting undetected under their nose. Or important, untapped opportunities they haven’t recognized. But selling to the C-Suite is beyond the scope of this post. And there are many more wrong ways do to it than there are right ways. That’s why we hosted a live webinar on selling to the C-Suite. You’ll learn how to lead effective conversations with senior executives, step by step. You’ll also see two real-life examples you can use as inspiration.